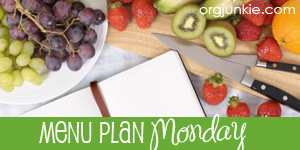 Even though I gave up blogging for a while, I never stopped menu planning. Menu planning just makes life so much easier. For a while I was planning breakfasts and lunches too, but I was having trouble sticking to it, so I gave that up. But I’ll never give up planning dinner. There’s nothing as stressful as coming home from a long day at work and not having anything ready to cook for dinner. And I’ve found that menu planning saves me money and time at the grocery store. So I’ll always be an advocate for menu planning. I’ve been trying to eat better lately. I noticed that I’ve gained some of the weight back that I lost before and after my gallbladder surgery (more on that later!). Some of it I definitely needed to gain, but now my clothes are getting a little tight, so I figured I should probably start eating healthier. I’ve been using MyFitnessPal to help me stay on track. If you’re on there, I’m LibrarianLizy; come say hi! For breakfasts I made a batch of orange-oatmeal muffins and I’ll probably have leftovers or a sandwich. I bought apples and cheese for snacks. Below is my plan for this week’s dinners. I’ve started getting Blue Apron boxes (tend to skip most weeks) but the weeks I get them I have dinner and some lunches planned for the week. It’s great for us to have a plan a few nights a week otherwise it’s an afternoon of “What do you wants and no I don’t feel like that messages. I’ve seen the Blue Apron thing on Instagram. What’s that about? Some of the meals you’ve made look amazing!